Sri Lanka Massage Places and Ayurveda Spa's Information Directory: Hiru Sandu - Ayurvedic Treatment Center & Spa - Battaramulla. Hiru Sandu - Ayurvedic Treatment Center & Spa - Battaramulla. 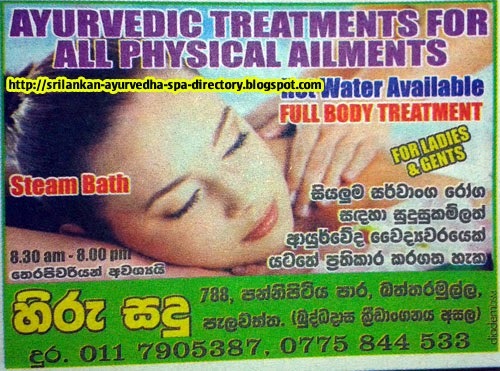 Hiru Sandu - Ayurvedic Treatment Center & Spa, No. 788, Panniitiya Road, Battaramulla.